There is a moment early on in Superman #35 where Lois Lane declares that "The Daily Planet is finally getting interesting again." It's a bit of sarcastic meta-commentary on the part of Geoff Johns and Lois Lane is the perfect person to voice the sentiment. 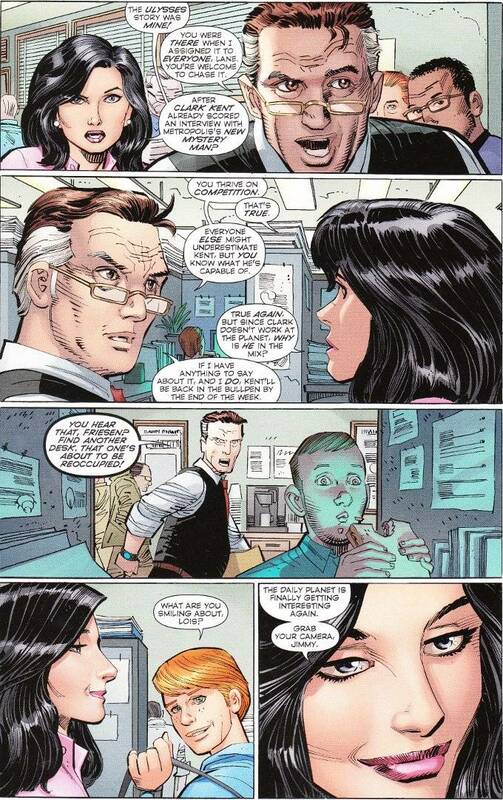 Ever since the New 52 reboot, there has been precious little of The Daily Planet staff in the Superman books and very little was done with them the few times they did show up. Lois Lane in particular was reduced in stature, transformed from Clark Kent's friendly rival to a mean girl who kept ignoring nice-guy Clark. To paraphrase a line from Mark Waid, most of the recent Superman comics put more emphasis on "the Super" over "the man". 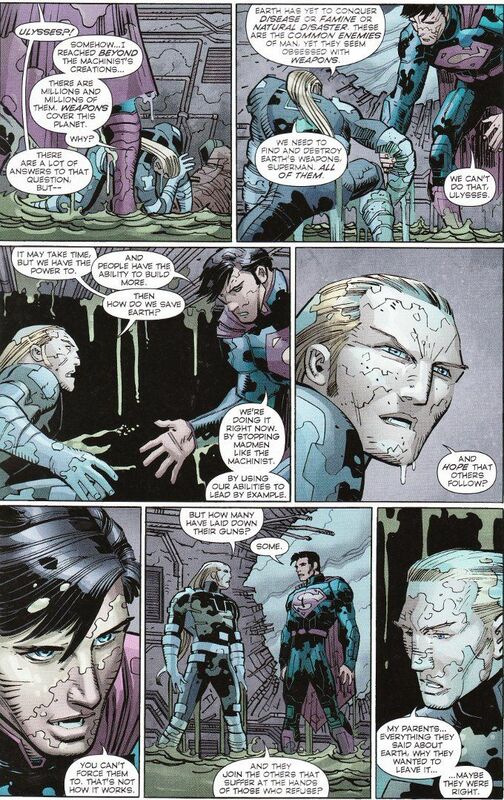 That is entirely the wrong way to write a Superman story. Geoff Johns knows this and the current "Men Of Tomorrow" arc has centered less upon thrilling action sequences and more upon Clark Kent, as he attempts to teach the technically-human but totally-alien hero Ulysses about morality and what it means to be human. We still get some thrilling action, of course, but the focus is on the spirit of Superman - the friend who always there to help. Thinking on it, that may be why John Romita Jr., Klaus Janson and Laura Martin were selected to be the art team for this particular story. JRJ has a well-deserved reputation for being able to put a great deal of heart and energy into scenes of two people just talking. Colorist Laura Martin modulates the palette subtly throughout the issue, with Superman's usual bold costume colors becoming more muted in the quieter moments. And Klaus Janson does his usual stellar job in making the bright moments all the brighter through creative shadow construction.